The TWA5 and TWA6 are rugged industrial weigh fixtures with designed in features to provide self leveling and self adjusting for thermal expansion. These features along with the pre-drilled mounting plates take the guess work out of installations to weigh tanks, bins and large containers . Use multple units to suport your structure and a Summing Box such as the SBJ Series to link the multiple units into one output signal representing the total weight. The units come fully assembled with a precision Omega load cell included. The TWA5 is Nickel plated carbon steel and the TWA6 is stainless steel. 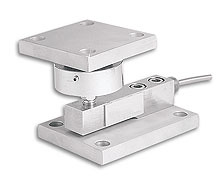 The load cell used in both models is stainless steel. The TWA5 and TWA6 are also available in metric configurations, with ranges from 0-25 to 0-10,000 kgf. Please see the TWAM5 for complete details, or contact our Pressure department for more information. Thermal Expansion: Self-adjusting for up to ±1/16"
Height: Adjustable per dimension "J"
Nota: For Specifications on Weighing Assemblies Review PDF link below. For Specifications on LC501 Load Cells review related link below.